Colombia travel guides, tips and inspiration for your next trip. Colombia has emerged from decades of civil war as one of the jewels of the continent and one of the best places to travel in South America. Positioned on the equator, it boasts a variety of terrains that is tough to beat. You can delve into the Colombian Amazon, chill out on Caribbean beaches, sample coffee from the Zone Cafetera and soak up the atmosphere in old colonial towns such as Villa de Leyva. That’s all before you even get to Bogota, Colombia’s rather frenetic capital. Gorgeous beaches, pristine jungle and the crystal-clear waters of the Caribbean await those who travel to Tayrona National Park. The park may take a little getting to but once you’re sitting on your own stretch beach, chilling with your new besties, I think you’ll agree that it’s totally worth it. 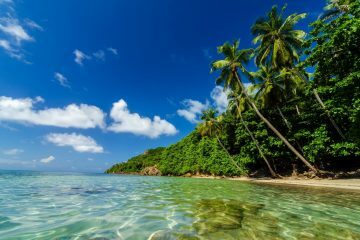 It might not be the first country you think of for a beach getaway, but Colombia’s beaches have to be seen to be believed. 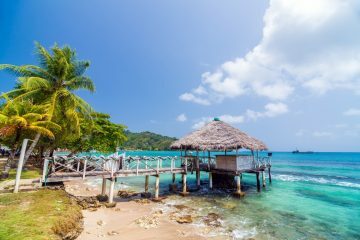 The Caribbean coast has more than its fair share of idyllic spots, but if you really want something special, head to San Andres and Providencia – two Colombian islands perched amidst the Caribbean Sea. Cartegena (full name – Cartegena de Indias) may draw in the punters with its beautifully preserved old colonial buildings but it keeps them with its unique culture – a blend of South American and Caribbean influences that’s hard to resist. The UNESCO World Heritage-centre is a charming collection of cobbled roads, streetside cafes, blooming flowers and buildings that look like they’ve been plucked straight out of a fairytale. Take some time to wander around with no set itinerary: there’s always something special just around the corner. Colombia’s capital left me with mixed feelings – sure, there is incredible street art, cool museums and (most importantly?) a craft-beer brewery but it didn’t quite do it for me. Still, it’s a pleasant enough place to start or end your travels in Colombia and an easy enough place to while away your time. A jungle hike to a lost city buried deep in the Sierra Nevada? It might sound like something taken straight out of Tomb Raider but the hike to the Ciudad Perdida has gained a cult reputation as the best hike in Colombia and a must for your South America itinerary. Make like Indiana Jones and strike off into the jungle – you’ll ford rivers and climb steep paths in pursuit of Teyuna, a city dating back to 800 AD and buried deep in the forest. Once the centre of Colombian corruption (and famously the home of Pablo Escobar), Medellín has burst onto the scene as one of South America’s digital nomad hotspots. You can see why: cooler than a popsicle straight out the freezer, it’s a haven for talented street art, chic cafes and gorgeous green spaces. The nightlife scene is immense – bring a lot of energy. It’s tougher than you think to get a good cup of coffee in most of Colombia, something I will never understand as they produce some of the best coffee in the world. A trip to the Zona Cafetera is a caffeine-fuelled adventure, taking in the small-scale fincas who produce the excellent coffee for which the country is famed. Leave space in your suitcase, you’re going to want to bring some of this home.